Chromatic aberration is often described as the inability of the camera lens to project all the wavelengths of the reflected light from an object to hit the same focal plane (longitudinal chromatic aberration). This is also known as dispersion. Usually this happens more often with cheaper quality lens (more prominently and frequently) but is also a phenomenon which is likely to affect most wide angle lenses when shooting pictures at its widest apertures. Even Canon’s state of the art L series lenses are also affected by it. Another type of chromatic aberration is known as transverse chromatic aberration which happens because the magnification of the different wave lengths of light differently through the lens elements. Both longitudinal and transverse chromatic aberration can happen at the same time and affect the colors of the picture. Chromatic aberration is often also referred to as color fringing. At the edges of the frame or where the light and dark shades transition, color overlapping (or fringing) is visibly prominent. In order to correct this problem of different wavelengths of light hitting the focal plane at different points a set of achromatic glasses are used. They have different refractive indexes and can bend the light waves representing different colors at different angles and thus project them all on the same focal plane. Chromatic aberration can also be corrected using lens elements made of materials which has low dispersion. Canon’s UD (Ultra-low dispersion) elements based lenses are known for their sharp image qualities. Fluorite is a material that is widely used in the higher end lenses from major manufacturers. Fluorite is known to have lesser amount of dispersion when compared with standard glass elements in lenses. Fluorite can thus, to a large extent, correct the problem of dispersion or chromatic aberration in cameras. Back in the 1960 when Canon first discovered how to successfully create fluorite crystals it was a break through of sorts which resulted in shaper lenses even at wide apertures. Today Canon uses a combination of Fluorite elements, UD glass and Super UD glass to reduce chromatic aberrations in its superior quality L series lenses. 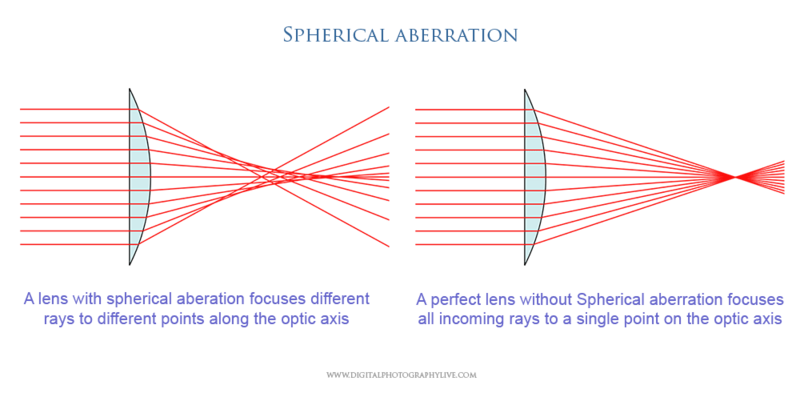 Comparatively spherical aberration is the ability of the lens elements to bend the light hitting its edges more than those that are hitting it towards the horizontal axis. Spherical aberrations are thus caused when the parallel rays of light hitting the lens element do not converge at the same focal plane. The effect can be identified with less than sharp image quality. This specially affects faster lenses when shooting at its widest. Generally cheaper built lenses are known to suffer from the effects of spherical aberrations more than the better built ones. Cheaper built lenses can thus be very difficult to use and achieve professional quality sharp images at times. To counter the problem of spherical aberration, lens manufacturers use aspherical elements on their lenses. These elements are curved at one side of the lens (the inside) which has the effect of focusing all the refracted light to hit the same focal plane and thus create a sharp image.